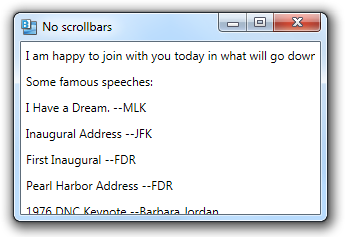 None of the WPF panel controls (containers) automatically provide scrollbars. If their child controls do not fit in the available space, the child controls are clipped. In the example below, we have a vertical StackPanel with a series of Label controls. Notice that the first label doesn’t fit the width of the window and is clipped on the right. The last label also does not fit and is clipped at the bottom of the window.